It’s Saturday night in Sweden. I’m sitting with friends in the Scandic hotel bar. In need of another beer. My pint glass has been sitting empty on the table for over 40 minutes. The bar was just a few feet away. But yet my glass was still empty. Why? Because I was transfixed in one of the best debates I have ever had during a WRC event – Who is going to win? I can’t remember the last time I had a debate like this before the final day. 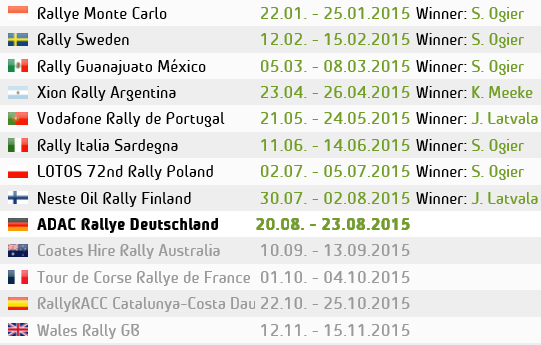 Certainly not in the last 7 years I’ve been regularly going to WRC events. Normally, due to the Loeb/Citroen Years, or the Ogier/VW era. These sort of conversations used to start with, “Who do you think is going to win?” To which the immediate response would be, “Ogier!” End of conversation. Not this time. With Thierry Neuville repeating his Monte misery, and going ‘kaput’ on Saturdays final Mickey mouse stage. Latvala had the lead but only by 3 seconds to a fast Tanak who was sitting very pretty in 2nd, hungry for his first win, and then of course, the masterful Seb-O in 3rd. Not out of reach, certainly not out of contention. The debate, raged on. Tanak is hungry, super hungry, and fast! Look at what he did on the Monte’s last stage, with only half an engine working. He developed the fiesta, he knows that car well. Latvala, cracks under pressure, especially Ogier pressure whose back in 3rd. But this is a new Jari, his sisu and his mojo has returned. His back to his confident self in a home-grown team. Then there is the Ogier factor. Never to be over looked. Always has plenty more in reserve. However the ex-VW man has yet to find the fiesta’s ‘Sweet Spot’. Still needing to find comfort, confidence and stages without mistakes this year. Sundays first stage, and that was one question answered. Going into the first corner backwards put an end to Ogier’s victory hopes, dropping a good 17 seconds. Tanak in, fastest so far. But then enters Latvala from stage left. Throwing his Toyota around the rather amusingly named Likenas stage. His Yaris dancing through the opening twisty first section of the stage in front of us, almost like he was auditioning for some sort of Strictly come driving dance show. Perfect, fun, confident and most importantly, fast. Very fast. 7 seconds quicker than anyone. I have to point out here, before the drivers move on to the repeat of that stage – How incredible these new cars are. So aggressive. Some beastly, others slicker, but all different and jaw-dropping in their own way. The noise is just awesome, especially echoing through a frozen pine forest. And to see them at these physics defying speeds, on a surface that im struggling to walk on is mind-blowing. In Rally Sweden, the spectators have more ‘Offs’ an ‘Rolls’ than the drivers do. Saturday was my personal favourite. Traveling on the escorted tour, as I often do with my good friends at RallyTravel. Got us to the best two sections any rally fan could want. The famous Colins crest and the not as famous Viking arena. The last section on Hagfors stage, on the ski slopes. Used in the past as the final power stage. The jumps were awesome. It’s what we all dream about as rally fans. To see it in person, up close was even more mind-blowing than the sheer impossible speeds on the ice. Rally Sweden is certainly amongst the best events that I have experienced. And now, back to the action on the penultimate stage of the rally. Latvala seemed determined. Likenas2 confirmed it. Another 9.1 seconds faster. Making his lead a comfortable-ish 20 seconds with just the power stage to go. I have to say the power stage was very well planned by the organisers. In that the drivers would finish the stage and drive straight to the proper Service park finishing podium. Finally a proper finishing ceremony for the telly. Stood there, watching it happen on the big screen, above the empty podium steps and champagne bottles, as the crowds gathered. The last part of power stage was at the back of the service park. Giving us a bit of the TV stuff and the live stuff in the distance. A nervous crowd of the Toyota team came and joined us fans to watch the screen. “Latvala has made it this far, come on. Win it, don’t bin it!” We said to ourselves anxiously, as we watched closely. You could cut the atmosphere with a butter knife. Tommi Makinen’s usually unreadable face, was a look of worry and hope. Watching his long time teams dream hopes, get closer to coming true. 20 second lead, he’ll take it easy I thought to myself. Not a chance. Latvala was in the zone and was fully punk rocking it. The stunning, catch me if you can Helicopter footage showed his impressive speed on the white stuff. Into the final corner, wildly fast. Fully on it and across the line. The crowds go mad. Makkinen goes barmy, like a flea hopping on hot coal. They had done it, he had done it. What was meant to be a development year has just become a genuine fight for the title now. The world’s attention turns to the finishing ramp. The mist pours out of the fog machines. In a sort of stars in their eyes style, stage entrance extravaganza. Tonight Mathew, I’m a Rally Sweden winner. Toyota & Jari matti Latvala, with Miikka Anttila by his side, had just won Rally Sweden. The first for the brand new Toyota team. Not only that, but won the power stage bonus points too. The tears an cheers of joy, expressed just how much this meant to the whole team and fans alike. The champagne had never tasted sweeter, literally. Talking of drinks, I never did make it the bar for another pint on that Saturday night. Check out all the Pics from Rally Sweden and other events in the photo gallery section. This entry was posted in Dan's WRC Blog, WRC and tagged Action, Blog, Cars, Motorsport, photos, rally, Sweden, WRC. Bookmark the permalink.